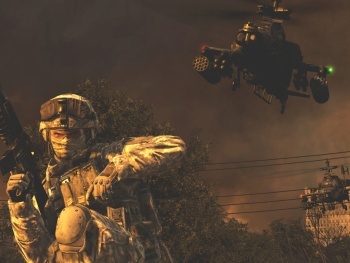 South Australian Attorney General Michael Atkinson said he will appeal the MA15+ rating of Modern Warfare 2, claiming that Australia's Classification Board pulled a fast one in order to get the game into the country. Atkinson is already infamous among gamers for his steadfast refusal to allow the creation of an R18+ videogame rating in Australia, the result of which is that games like Left 4 Dead 2, Grand Theft Auto IV, Risen and many others are either censored for Australian audiences or simply banned outright. Given all that, I was a little surprised to find that Modern Warfare 2 had been passed with an MA15+ rating. Atkinson, on the other hand, claims he wasn't surprised at all; in fact, he seems to think that the Classification Board is playing fast and loose with the rules in order to accommodate the game industry. "This decision doesn't surprise me. The Classification Board in Australia does everything to try and get games in under the radar," he said in an interview on the radio program National Interest. But at the same time, he reiterated his support for the current age restrictions on games in Australia, saying, "Just because the system is not being applied properly, it does not mean that the principles of the system are wrong." Atkinson told GameSpot Australia that he's never before appealed a Classification Board game rating, but said the decision to rate Modern Warfare 2 as MA15+ was simply "wrong." "I worry about any game that encourages gamers to perpetrate extreme violence and cruelty on screen, but this game [Modern Warfare 2] allows players to be virtual terrorists and gain points by massacring civilians," he said. "Expecting game designers to be responsible by not glorifying terrorism will always lead to disappointment." I find it both amusing and slightly disturbing that Atkinson sounds almost as fed up with the Classification Board's nonsense as Australian gamers, albeit for completely different reasons. But in a twisted way, I do agree with him on the point: The Classification Board as it stands simply does not work. It makes no sense at all to refuse a classification for Silent Hill: Homecoming while letting Modern Warfare 2 into the club uncut. Despite Atkinson's assertions, however, it's not evidence of collusion with the gaming industry but rather of the arbitrary, borderline random, nature of the system. In order for the appeal to go forward, Atkinson must request that Australia's Federal Minister for Home Affairs apply for a review of the rating to the Classification Review Board, "an independent statutory body that meets and views the material, hears any submissions from interested parties, and makes a fresh classification decision." It's unclear how long the process will take or how likely it is to succeed; the Classification Board said that government officials get the same treatment as any other "person aggrieved" who appeals a rating.